Words can create images in our heads, causing us to immediately connect that particular word with something to which we can relate. Often, vehicles are named after something we find intimidating, interesting, or something that speaks to another part of us. The word viper conjures images of a terrifying snake with a deadly bite, and given the vicious power of the Dodge Viper, it is easy to see why it was so named. While if driven safely, it won’t be deadly, the Viper may cause incapacitation from the ecstasy of driving this powerhouse sports car. In 1991, the Chrysler Corporation debuted the first Viper, then called the RT/10 Roadster. It was brought in as the Indy 500 pace car, when it became clear that the Dodge Stealth would have to be replaced. With an 700 pound, V10 engine produced by Lamborghini, the Viper hit the scene with a deadly strike, much like its namesake. While only two of the Vipers were produced in ’91, it became clear to the Dodge Company that this car could perform quite well. So, the Chrysler Corporation went back to the factory, and cranked the Viper out for mass release in 1992. The initial release of the vehicle had a specialized, finely-tuned design on the outside that included a sleek handle-free door. There were imperfections in the design, as it did not have a roof or side windows, and the interior was free of any of the comforts drivers were used to in luxury vehicles. Dodge offered a soft top cover for the car that was far from easy to attach, and was primarily used only to store the Viper indoors. 1994 marked the first year that Dodge began offering a hard top for the car that was easily attached. The Dodge Viper is now in the third phase of its second generation, and it keeps getting better and better. 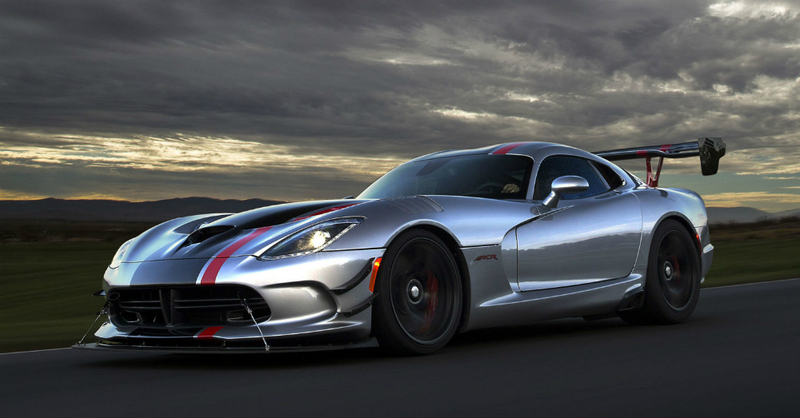 Still featuring a V10 engine, the 2015 incarnation of the Viper features 645 horsepower and 600 lbs. of torque. The driver customizable suspension lends to better handling and allows for traditional road driving or a quick trip around the track. Previous versions of the Viper proved quite difficult to control, especially for novice drivers, but newer versions include an Electronic Stability Control System, and a Brembo braking system for maximum control and comfort. However, all of the new safeguards are no match for safe and conscientious driving, especially when considering the sheer power under the hood of the Viper. The exterior of the Viper has very clearly been designed for maximum performance, with a great focus on making this vehicle as aerodynamic as possible. Appearing to be one solid piece, the Viper is as streamlined as a car can get. In the SRT, the starting model of the Viper, a carbon fiber hood is designed with specialized air vents that were carefully considering for maximum air expulsion to cool the massive engine, and air intake to assist in reaching the engine’s full potential. Also gone are the days of the stripped down interior, as the new Vipers offer the best technology that Dodge can offer. Using push button start as the jumping off point, Dodge has managed to pack the interior of the Viper with the amazing UConnect system featuring an 8 inch touchscreen. The UConnect system features GPS, Bluetooth, Wifi, and the ability to download apps for your driving convenience, and other convenience technology. A digital driver information center and upgraded Harmon Kardon speakers round out the technological upgrades that make it clear this isn’t the Viper of the past. The 2015 Viper is available in three different trim levels, with a starting price of just under $85K. The top of the line model tops out at over $110K, but many die-hard fans of the Viper would argue that an eleven and a half second quarter mile makes it worth every penny. Skilled drivers can coax 60mph out of the Viper in a mere 3 seconds, and will easily express the incredible adrenaline rush they feel from only a couple of seconds worth of driving. Precision is key when it comes to getting everything out of the drive that you can. There are a lot of things in the world that look beautiful but are considered unsafe for contact. While people will benefit from a look but don’t touch position with the snake version of the viper, the vehicle is made for driving. A performance car at its finest, Dodge made the Viper beautiful, but are also begging for you to touch.